In this issue: Several articles about The House On The Cliff, including the outline written by Edward Stratemeyer and used by Leslie McFarlane for the original story! Plus new collectible discoveries and more. 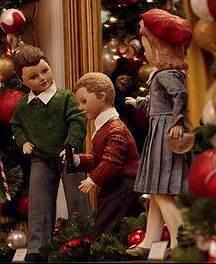 The Hardy Boys and Nancy Drew visited the White House this last Christmas in the form of figurines used by First Lady Laura Bush to decorate the White House in a children's book theme. 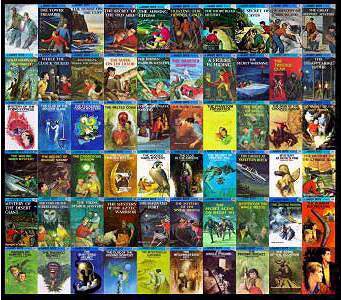 Mrs. Bush stated that Nancy Drew was one of her favorite series when she was young. I don't know who made these figurines or if they will become available to the general public. After a long period of neglect, I've just updated my own Sales Page. 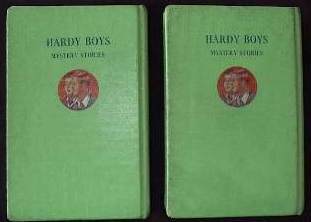 I've listed many Hardy Boys items including collectibles and many foreign editions. I will be adding new items every week, so visit regularly! 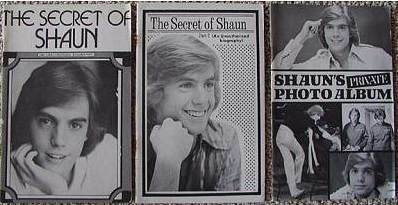 Your purchases help make The Bayport Times and The Hardy Boys Unofficial Home Page possible. 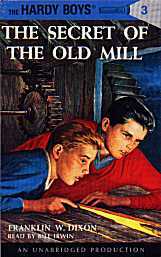 Check out the New On The Shelves section for the latest Hardy Boys stories or visit my Amazon Sales Page for a huge selection of Hardy Boys, Nancy Drew, Tom Swift, Chip Hilton, Judy Bolton, Horatio Alger, Harry Potter, Bowery Boys, 3 Stooges and other books, CD-ROMs, videos and DVDs. New Cover Art & Imprint! Completely re-typeset hardcover versions of Digests. Great Collectors Item! Fictional story about "Frank" Dixon and Carolyn Keene! The Hardy Boys, along with their girlfriends, Callie and Iola, are vacationing in the tiny Caribbean island country of San Esteban. The action starts from Chapter One when their rented plane almost crashes! When they finally arrive at their destination, they are beset by numerous calamities, such as an escaping bull, deadly insects, vandals and a local glad-handing politician! There's plenty of action in this story (every chapter ends in a cliff-hanger) but the mystery itself is ill-defined. Everything finally gets rolling when a fierce tropical storm hits the island and our heroes are pursued by a blow-dart wielding thug into a network of underground passages. Naturally, the Boys overcome all obstacles and solve the mystery in a surprise ending. The Hardy Boys are in Paris attending an amateur soccer tournament which is beset by protesters. Someone is trying to sabotage the match and Frank and Joe quickly get involved. The trail leads them to a secret passage in the Louvre, an ancient castle and the Paris Catacombs! Along the way their father, Fenton, gets kidnapped and the Boys are hot on his trail also! 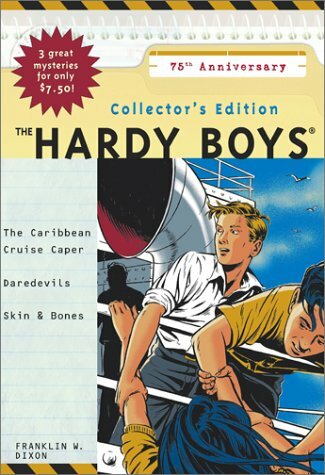 The action in this story is non-stop and, unlike some other recent Hardy Boys stories, extremely plausible and will keep you on the edge of your seat right up to the surprising finale! This is one of the best Hardy Boys stories in quite a while. This adventure finds Frank and Joe in Africa where they get involved in smashing an international poaching scheme. The story lags in the beginning, especially in a ludicrous subplot which has the Boys saving an airliner from crashing. Once they get to Nairobi, the action is non-stop and carries the reader right along to the rather disappointing and predictable climax. In spite of its flaws, I enjoyed this book and read it in one sitting. 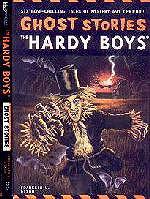 This tale takes the Hardy Boys into the realm of the supernatural, a place that they would have been well advised to avoid! Seems a whole family of psychics have moved into Bayport and have aroused the ire of superstitious townsfolk. Naturally, Frank and Joe get involved in tracking down the psychic's vision of a long-ago kidnapping of a rich man's daughter. The outcome is predictable, of course, and the plot and dialog are laughably bad. The Hardy Boys are attending an air show with their friend when a rash of airplane thefts gets them involved in an even deeper mystery involving the theft of $3,000,000.00 worth of rare coins. The action in this story is non-stop (albeit a bit implausible at times) and the reader is carried right along to the surprising climax. This book was a real page-turner and had me on the edge of my seat! I have transcribed the original plot outline which was created by the Stratemeyer Syndicate (and probably by Edward himself) and used by Leslie McFarlane. I obtained this from the Stratemeyer archive of the NY Public Library. Editor's Note: Spelling, spacing and punctuation errors are reproduced from the original document. Words/letters in bold were hand written corrections to the document, which was typewritten. There is a handwritten notation on the upper right corner of the first page: "L. McFarlane Dec. 8 1926 125"
Stratemeyer Syndicate Books                    Return with MS.
outline for                                  216 text pages. rocky cliff overlooking Barmet Bay and some eight miles from Bayport. word about vol. one----starts to rain, cycles under shed, inside again. lives!" yells Frank. Crash! part of the ceiling falls on crowd! breaks down---under a shed--discovery his toolbox is empty--so is Joe's! Sure-they had tools when they left home. What did itmean? cliff--"See, another motorboat is chasing it!" other boat lost in gloom--The rescued man brought ashore unconscious. Taken to farmhouse--mumbles "Snackley got me, the rat!" along. No answer to knock--place looks deserted--What can it it mean? away in it. Heard auto go up shore road--boys try to follow, in vain. mouth shut. He must be a squeeler on gang." Detective takes up case. Tells boys 'U. S. authorities think smugglers are operating in Barmet Bay. Wonders if Snackley is there--reward offered for rascal's capture. Mrs. Hardy is worried---her husband always signed as agreed, no other way. Has there been foul play? Detective has many old enemies. Vacation week--Mr. Hardy still away---not in city nor around Bayport. gone to house on the cliff and disappeared? to find house open, weeds cut down. Two men and a woman in charge . Say they know nothing of Mr. Hardy and hint they want boys to leave. Frank sees something, asks for a drink, delays. Comes away at last. "Did you see that cap on the peg, Joe?' It was dad's cap!" Boys hold a council of war--go back. "Where did you get that cap?" man. "this is private property--don't land or you may get shot." Was that man Snackley? Motor away but resolve to hang around. "Li Chang's share." Smugglers--voices disappear in cliff. Silence. stuff surel"  Onward--almost discovered--forward again--more voices. they never return," says Snackley. Secret of the Old Mill." Boys talk it over with their chums. Note. The shriek and crash were, of course, worked to scare boys away. Miser Polucca had been murdered by  Snackley, as Mr. Hardy discovered. man had thretaned exposure because he did not get his full share of money. What is it that makes the bad guy bad? Why can't he stop being the bad guy if he so chooses? Are criminals always inherently bad people, or would it shock us to discover just how many of them start out as normal folks like us? These are questions that are sure to cross the mind of any reader of literature who encounters a character who is the antagonist in a given story. Readers of the Hardy Boys mystery series will certainly ask these questions at some point as well. It only makes sense to wonder, "Where did Franklin W. Dixon come up with all these bad guys anyway?" "Am I really to believe that Bayport is teeming with low-lifes whose sole purpose is to create havoc with which our teen sleuths Frank and Joe Hardy have to deal?" Thankfully, a chronological read of the Hardy Boys series will dispel these lingering questions quickly, as book number two, The House on the Cliff, is nothing less than Dixon's treatise on those people who fall into the life of crime. In this volume, Dixon lets his readers know that these characters are not necessarily of a different breed than the Hardys themselves, that they are ensnared in a authoritarian system, but that they can ultimately be redeemed. Early on in The House on the Cliff, the reader discovers a conversation between the Hardy boys and their parents, Fenton and Laura Hardy, around the family dinner table. Frank and Joe have been examining a house formerly owned by the now deceased Felix Pollitt. They suspect that a smuggling gang run by Felix Snattman is operating out of this house. The property has been left to Mr. Pollitt's nephew, who is wanted for burglary. Clearly, the nephew has not stepped forward to claim the property, as he realizes he'd be opening himself to arrest and subsequent jail time instead of immediate possession of the house. Fenton suggests that the nephew may not necessarily be a "worst case scenario" criminal, to which Frank puts forth the idea that the nephew could step forward, serve his potentially brief jail sentence and continue to live his life as a normal law-abiding citizen. Mr. Hardy, however, points out the fallacy in Frank's logic: "'The trouble is, so often when a young man joins a group of hoodlums or racketeers, he's blackmailed for the rest of his life, even though he tries to go straight. . . . The best way to avoid such a situation is never to get into it!'" (Dixon 38). It is incredible that Dixon lays forth this degree of complexity and moral ambiguity for his generally young reading audience. Conventional wisdom would suggest that Dixon should keep the characters in his stories as either all good or all bad. However, in this brief explanation, Dixon makes his readers aware that many of the bad guys are good people who are locked in a nearly inescapable situation. At the same time, he explains that it's no accident that some of the bad guys are that way. In fact, to avoid becoming a criminal, one simply must refrain from associating with crime. Dixon later gives the reader a glimpse of how authoritarian the leadership structure in a group of criminals can be, further propelling the idea that the system is set up to retain its members. While in hiding in the smuggling operation's storeroom, Frank and Joe overhear two of the gang's lesser members arguing about retrieving some extra smuggled fabric so they can make more money by higher volume in sales. The one member replies to the other, "'I can tell you ain't been with this gang long. You never get any thanks around here for thinkin'. . . . My idea for the rest of us in this gang is to do just what Snattman tells us to and no more'" (Dixon 109). Clearly, Dixon is demonstrating to his readers a system in which all but the man on top are encouraged to be "yes-men". This is further seen when Snattman himself talks down to two of his underlings who are uncomfortable with the idea of allowing the captured Hardy boys and their father to starve. He says, "You guys are gettin' awful righteous all of a sudden, aren't you? Look out or I'll dump the lot of you!" (Dixon 129). Here we see Snattman berating his colleagues for thoughts that aren't as hard-edged as his own, and he immediately plays his power card, threatening them to be cut out of any profits in their criminal activities. Of course, this threat is something of a rhetorical comment, as the two underlings know full well that they cannot be cut out of the system. The crime itself acts as a bonding agent between Snattman and those under him. The House on the Cliff ends no differently than most Hardy Boys books; the bad guys are all caught and order is restored. Typically, Dixon allows the antagonists to have their say in the last chapter, where they fill in all the unanswered questions about the mystery and always seem to confirm that Frank and Joe's intuition was right all along. In this book, though, Snattman not only offers an explanation about how his smuggling ring was run, but he also talks about the factors early in his life that led him to his life of crime as well as expressing remorse for the life he has lived. Snattman remarks, "'I envy you, Mr. Hardy. It's because you brought up two such fine boys and they got swell friends. Me-I wasn't so lucky. My father died when I was little. I was pretty headstrong and my mother couldn't manage me. I began to make the wrong kind of friends and after that-you know how it is. My uncle, who owned this place, might have helped me, but he was mean and selfish and never gave us any money'" (Dixon 177-178). In this explanation, Dixon contrasts the good upbringing that Frank and Joe have had with Snattman's. In fact, he seems to recognize that there are uncontrollable influences that can make one more or less prone to a life of crime. Things such as a good father and swell friends are likelier to lead one toward law-abiding detective work than the early loss of a parent, the wrong friends, and stingy relatives. At this stage, it would be tempting for Dixon's impressionable young readers to think that he is giving Snattman a valid excuse for his criminal activities. Instead, Dixon portrays Snattman as feeling remorse and putting actions in place that will help steer boys with rougher upbringings such as himself in the right direction. The reformed criminal comments that "'I'm going to ask those executors to use my uncle's money to run this place as a boys' home-I mean a place where boys without proper home training can come to live'" (Dixon 178). Not only does Snattman recognize his wrong-doing and is willing to accept the consequences of it (in his case, a healthy jail sentence), but he goes out of his way to help make things right for others who might find themselves in a similar predicament. 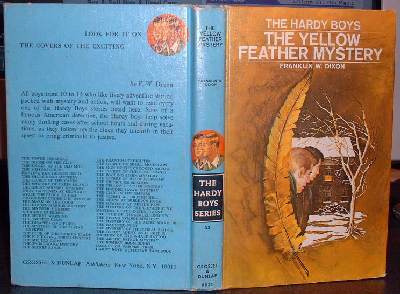 The House on the Cliff, then, offers a model for the back story of the criminals in the remainder of the Hardy Boys canon. Dixon realizes that he perhaps will not have time to explore each future antagonist as thoroughly, so he leaves his readers with some ideas about the life of crime. First, it is something that can ensnare anyone who has made some poor initial choices. Second, the system itself is set up to retain its members; often there is no easy escape from it. Most importantly, the life of crime has its consequences, and although rooted in early factors, each person who chooses to participate in it is responsible to own up to their actions. 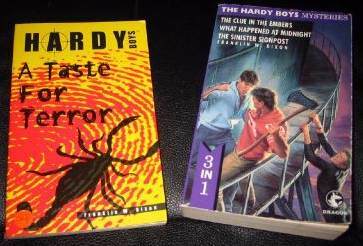 With these ideas in mind, the Hardy boys reader is sure to have a richer experience as he continues to explore the adventures of Frank and Joe and their striving to snuff out the actions of the characters involved in the life of crime. 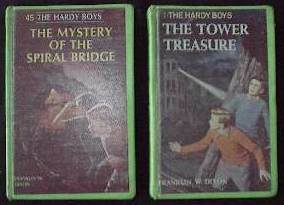 In my past work, I have made painstaking effort to show that the covers of Franklin W. Dixon's Hardy Boys volumes have just as much, if not more, to say than the text of the books themselves. Let the reader understand that the true towering treasure and hidden gold is found not in the text, but in the pictures depicting the events occurring in the text. Until this point, I have tried to demonstrate this based on analysis of volume covers alone. However, if Dixon so skillfully used volume covers to convey profound truths, should we not think that the illustrations within the text would be used for the same purpose? Moreover, this work will demonstrate that on occasion, Dixon is telling a completely different story in the illustrations throughout the book than he is in the actual text. In no volume is this clearer than in The House on the Cliff. The first illustration of the book, on the page opposite the title page, immediately tips the reader off to the theme that Dixon wants to illustrate through the pictures. It is a picture of a lowly, shabby man named Pretzel Pete. The caption has Pretzel Pete telling Frank and Joe, Maybe I can give you a tip where to find your father. This is Dixon at his best. Before the first page of the text, the illustration makes the problem clear: the Hardys are looking for a father figure. This is supported throughout the text of the canon as one examines the relationship between Fenton Hardy and his sons. The relationship, if you want to call it that, consists of little interaction. Though the Hardys often claim to be working for their father, he is rarely around and the reader is left with few options except to consider him a type of absent, workaholic father. The Hardys have not gone unaffected by this, and the illustration opposite the title page makes this clear. They have chosen to go to this lowly Pretzel Pete, a man represented in the picture as a bum, in search of a father figure to mold them and shape them as they move through the late stages of adolescence. Here the reader may object and say that Fenton Hardy has more involvement with his boys in The House on the Cliff than in many other of Dixonian works. But don't miss the mastery of Dixon! While there may be more interaction between the boys and Fenton in the text, the true story is told in the pictures and thus priority should be placed there. The lowliness of Pretzel Pete in the first illustration shows just how desperate the Hardys have become in search for a father figure. They are willing to be fathered by a man on the street because their own father has failed them. Nevertheless, Pretzel Pete doesn't want to be a father figure to these boys, so he sends the Hardys somewhere else with his "tip" on where to find their father or, more importantly, a father figure. The next point in the Hardys search for a father figure comes in the illustration on pp. 8-9. Pretzel Pete has apparently sent the Hardys to a cliff overlooking a lake. Whether Pretzel Pete told the Hardys to bring a telescope is unknown, but we can infer that the telescope is a sign that the Hardys want to see this man up close for who he really is. If they didn't really know their real father, they at least want to know their father figure and see him with all of his strengths and vulnerabilities. And indeed the Hardys see a vulnerability. This man, far from running to the Hardys as a loving father would, rowed his boat to a ship and is climbing up the ladder to get in the ship and avoid the Hardys. Where now will the Hardys turn? Not only had Fenton Hardy failed to be a father figure to them, but now Pretzel Pete and this man on the water have failed as well. There are no more tips, no other clues on where to find a father figure. The next illustration in the book on page 43 tells it all. Surprisingly this illustration includes Fenton Hardy with the boys. It is not clear if the artist intends for us to believe if Fenton Hardy was actually physically present with the boys in the picture, but the purpose for his appearance in the picture is clear. Frank, Joe, and Fenton, all dressed in suit and tie, peer in on a farming family. The family is bound and gagged. The illustration clearly conveys that while Frank and Joe desire a father figure from another family such as this farm family, and this family is willing to reach out to them. Frank and Joe are trapped in the white collar, upper class Bayport lifestyle that their biological father, Fenton Hardy, has given them. The contrast between the dress of the Hardys and the farm family is vivid and shows the gap between two lifestyles. Thus Frank and Joe remain helpless to find a father figure while the farm family, wanting to reach out to these young boys, is powerless to do so because of the reign that Fenton Hardy has over them. The family is bound and gagged. Thus the Hardys conclude that the only way to get out of this trap is to have their father murdered. Then they would no longer be slave to his reign of white collar, upper class sleuth work where their lives are in danger almost constantly and their education suffers because of the time they devote to their fathers work. And they could truly have a relationship with a father figure. This leads the Hardys to where we find them in the illustration on page 77. The Hardys are the home of an apparent hit man. It is not clear if the man by the tree or the man furthest right is the hit man, but there can be no doubt that one of them is a hit man by the facial expressions and posture given to them by the artist. Here, the boys hold out Fenton Hardys cap as a sample cap that the hit man can use to find Fenton Hardy based on his headwear. However, the caption has a woman shrilling, "He doesnt know anything about the cap". Apparently the woman is the spokeswoman for the hit man and saying that he is not familiar with this kind of cap. Here again, the Hardys are powerless not only to find a father figure, but to find a hit man to have their father killed so they can have a father figure. The artist leads us to believe that Fenton Hardy wore some kind of rare and expensive European leather cap that even a good hit man couldn't recognize. Thus the Hardys again are forced to deal with the gap between the extravagant lifestyle of their father and the rest of the world. If not even the best hit man in Bayport can get rid of their father, the Hardys conclude that there must be no way of getting rid of Fenton Hardy and thus no way of finding a true father figure. Hence the illustration on page 123. Here the Hardys and Fenton again are working together, all with their ties on and all in a dangerous situation where their lives are at risk. The story in pictures concludes on page 148. While Fenton has his arms around Frank and Joe, attempting to show them affection from his pride-filled heart, a smuggler shines a light on the trio and says, "You are my hostages." This is a brilliant caption. The Hardys are hostages not of a true smuggler, but of the representative smuggler, Fenton Hardy. The independence and identity of our two young sleuths has been smuggled away by Fenton Hardy, leaving the Hardy boys forever hostage to his domineering fatherhood and white-collar, upper class life of fighting quote-unquote crime. I conclude by contending that the observations drawn from this of pictures in "The House on the Cliff" are in no way inconsistent with the text of any book in the entire Dixonian canon. Does Dixon ever write about the Hardys having a father figure besides Fenton Hardy? We read much about the relationship between the Hardys and their chums and even Aunt Gertrude who is a type of mother figure. But there is no one else to be a father to the Hardys except the workaholic and often absent Fenton Hardy. Also, do the Hardys ever break out of the mold Fenton has created for them in any point in the canon? Never. Thus the reader is left with a dismal picture of the Hardys forever trapped in the lifestyle given to them by their father. We can only hope that the canon doesn't tell it all, but nonetheless, the canon is closed, and we can know no more of the Hardys than what has been revealed. Mark Bartlebaugh, a member of the HB Literary Society, is radio station manager of the Wheaton College radio station, WETN. To better appreciate this essay one has to imagine a baritone radio voice reading this aloud carefully enunciating every word. He and his wife, Yvonne, live in the western suburbs of Chicago. In Mr. Dixon’s second of the famous series The Hardy Boys, titled The House on the Cliff, the reader is taught something that is of such a timeless quality that it inspires vitriolic debates even today. The fast paced story could easily be read as an action filled couple of days culminating in the victory of the heroes, but there are present a very few points that Mr. Dixon has carefully placed in order to get across to the judicious fan a truth that the reader would do well to memorize and practice daily. We begin the story with Frank and Joe being told about smuggled imported drugs. These drugs are produced in India. How masterful of Mr. Dixon to use an illustration that is so timeless. There is, of course, an ongoing debate that surfaces every few years about the source of medications in this country. The domestically produced and FDA approved medications are 100% quality controlled and only bring with them the inherent danger all medications possess. That is, they are the 4th leading cause of death in this country. But foreign medications, which are not FDA controlled, may have contaminants in them that make them much more dangerous. The debate rages, however, because they are much cheaper. Mr. Dixon’s use of the criminals smuggling goods from a ship that would be bringing contraband into this country is brilliant. He is alluding to the problem our law enforcement faces because bringing Canadian drugs across the border is illegal on it’s face, and yet approved of by many powerful lawmakers and lobby groups. The problem can be boiled down to a simple struggle between the free will of the people versus the necessity of a secure border to prevent an open attack against our nation. The next instance occurs when Frank and Joe find a Turkish towel and a pretzel vendor willing to engage in a little racial profiling. Racial profiling has a negative connotation because of dreadful mistakes in the past like the internment of Japanese Americans. However, here is a case where the assumed link between a Middle Eastern towel, a Middle Eastern ship, and a Middle Eastern smuggler pays off. There’s also a brief mention of an oil tanker. It may well be glossed over as simply expounding on the description of the scenery in order to put the reader in more familiar surroundings, but that would be a mistake. Here we have Mr. Dixon brilliantly adding the oil situation to his argument for secure borders. How can we have secure borders when we are importing so much oil? There’s no specific mention of drilling in the northern slope of Alaska, but it must be assumed that Mr. Dixon is advocating a dependence on our own production of oil rather than the importation of it. Please, dear reader, do not mistake his brief invective against foreign oil as some sort of support for oil alternatives. That would be reading into the story and creating a pure fantasy. Mr. Dixon fully illustrates the necessity of oil in our culture from the motorcycles on page 4to the parking garage and bus on page 180. Soon we see the Coast Guard having some trouble because of an unregistered ship. This goes to the very heart of the debate. How far shall the reach of the government hand be? Can we not traverse the seas in anonymity if we so please? What about the right to privacy? Mr. Dixon is fully aware that there is no right to privacy and he illustrates that throughout this story. With so many rights of the individuals spelled out in the constitution, there is no mention of privacy. Mr. Dixon realizes that fact and tries very convincingly to illustrate to the reader why privacy must be tempered in order to secure this nation from terrorists, criminals, and even drug smugglers.